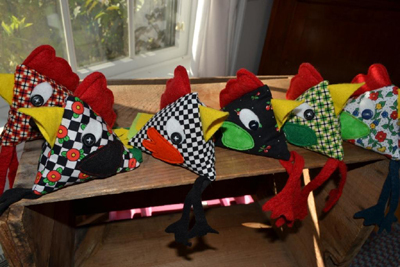 My silly chicken pincushions took on a life of their own at Maria Wulf's Open House this last October. I made ten and none came home at the end of the sale. So I made more, thirty-three to be exact and perhaps just in time for a perfect gift for the person in your life or perhaps even for your yourself? 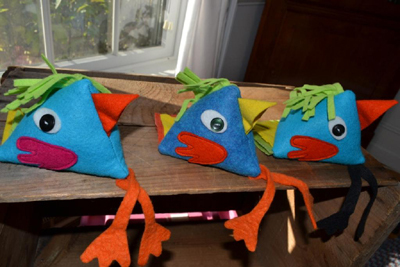 I now call them my Chicken Little Pincushions or soft sculpture art. We did note that when photographed they seemed to all have their mouths open and we think this is because they are "busy chatting with each other". They gave me pause to reflect following the election. I know that I was very engaged emotionally in this election season, so much so that the night of the returns I half-jokingly prepared a "suicide prevention kit" as I really didn't think my candidate had a chance of winning though I realized too that I rarely pick the winner ever. I am used to losing, and in fact, I think that on many fronts I might well be considered "a real loser". Despite two college degrees, I never chose my careers according to their ability to make money but chose instead jobs that were more about dedication to my principals, and serving others. As professions they were "good for women's work" (in my day), but then along came my health issues, necessitating me to cut back my hours, eliminate chances of promotions and eventually caused me to take permanent leave from my work. I learned that even when more money was needed to support myself and my family, I was better able to do this by taking on cottage industry work on the side, the sort that Mike Rowe features on his shows. While they weren't "dirty jobs" per se, they were the tedious and boring sorts, the kinds that no one else wanted to do. Even then,we still seemed only to make ends meet. I do have to own that my husband and I chose to live in the beautiful rural countryside of Vermont instead of sticking to city life where jobs were higher pay and more plentiful. We literally "chose" the harder way for ourselves to succeed monetarily, but then we followed our hearts and not money. Looking back on my life, I see now the value of those choices.We have had a quality of life that we wouldn't have found in the city though we rarely "had things go our way". We grew so used to not being "winners", that despite our quality of life increasing, our monetary success actually decreased. So it seemed only natural that election night I simply prepared myself for the worst outcome for my chosen candidate and prepared a thermos of hot, comforting Chamomile tea, stuffed several pieces of chocolate in a baggie to take with me when I escaped the inevitable negative election returns on TV to run to our bedroom and avoid watching him lose. I would retire early, pull the covers over my head to read the next book in my series of feel-good quilting novels and shut out the real world! One way or another I would make it through this long night and comfort myself until I got up the next morning to face the reality of losing once again! Fortunately, I had received an order on line that I worked to put together, while I had the TV tuned into the start of the election returns. I was even avoiding taking a real interest in watching them, and only half-listened. As I sat at my computer sending information to my customer, I was prepared and ready for the slide to begin when I would charge to our bedroom, escape into another world, and sip hot tea and eat chocolate.. I was so "chicken" that I worked to remain detached, though I had not missed anything during the entire political campaign. I couldn't believe what was happening as my chosen candidate didn't seem to bottom out...and his chances of winning increased. I even changed channels to get the other side's perspective, determined to not let me get my hopes up. I couldn't allow myself to even consider the possibility of my candidate winning! To make a long story short, I didn't flip the TV off until about two in the morning and my hot tea became merely a beverage as I started paying more attention. My suicide prevention plan would apparently not be needed this time. The next day I was truly feeling bad for my candidate's opponent and her followers, many of whom were my friends, though it still wasn't real to me there hadn't been some big mistake and that our victory would still be up-ended? This is how sure I was that my candidate would not win! This writing isn't about winning however, but rather about losing...I didn't realize until later when I saw the other side struggling with their feelings about the election that we are all "chickens" and become like Chicken Littles, and I mean this in the kindest of ways. We all seem to do all sorts of "catastrophe-sizing" about the future when things don't go according to our plans. I also began to realize how many good things I have learned about losing. Life goes on, however devastating our loss may be, and let me be frank, I have had some devastating losses (family members suffering and dying from MS, Parkinsons, and cancer; my daughters and I being diagnosed with late stage Lyme Disease, my youngest also born with a congenital chest deformity that made her chest grow inward during her adolescent years, crowding her heart and lessening her breathing capacity). Whatever the loss,we sought comfort, grieved, picked ourselves up, learned whatever we needed to learn and carried on to put our life back together again as best as we could. There are, of course, different stages of grief that we all go through as we gather the courage to face the difficult and begin again. Many things in life are beyond our control and often more important than winning is how we lose. Losing, I found, is just as much a "part of life" as winning and despite it or perhaps because of it, we are blessed! We gained faith during times of loss and learned that whatever we faced, God remained and still remains with us, helping us each step of the way and the more we practiced our faith during such times, the easier it became to trust that whatever happens, the next day comes, even when the skies are overcast. Who, however, in their right mind volunteers to lose something we hold dear, just to get stronger? We are all a bit "chicken" and though Chicken Little actually suffered more from from anxiety, his fears were real to him. I figure that we are all Chicken Littles at heart. We are easily shaken and crushed, but picking ourselves up and going on "is life". Though I wasn't disappointed by the election, my chosen candidate was really a substitute for the first candidate I had chosen that had lost in the primaries. I also realized that winning is not permanent, and losing will visit me again in the future! For those of you that are grieving and are in pain about this election, know that most certainly your side will win again. None of this is permanent. In honor of all who voted and dared to hope for one candidate or another, I want to offer you a chance to win a drawing for a free give-away Chicken Little. 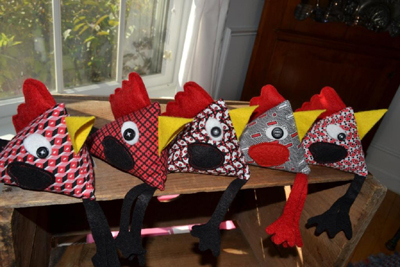 They are whimsical little pincushions or soft sculpture art that reminds us that we are all Chicken Littles and hopefully should you win one, it will make you smile and prepare to win again. It is my dream that both sides can contribute to making America the strong nation that will benefit us all! 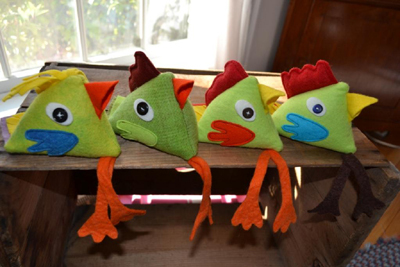 To win one of these Chicken Littles, please leave your name in the comment section following this blog. A drawing will be held two days after Thanksgiving and the winner announced. Thank you for participating and hopefully you will be the winner. If not they will be reasonably priced and for sale in my Etsy shop shortly after Thanksgiving! May you all have a wonderful Thanksgiving. We are indeed privileged to live in the USA and am grateful for all of you that follow my blog! Our final craft sale for this year will be at The Lakes Region Farmer's Market Christmas Fair, at Poultney High School Gym, Poultney, Vermont on the Friday and Saturday following Thanksgiving, from 10 a.m. to 4 p.m. We hope you will come and see us there. Labels: Chicken Little pincushions/or soft sculpture. Lessons from loss and losing. Oh my! These are cute! I need one of these. How much do you sell them for? Very cleaver cushions. Would look nice next to one of my machines. Yes, life is full of suffering but we must try our best to live well and be kind to ourselves and to others. All in all, it's a good life. The cushions brought a smile to my face. Love your the dangly leg! So clever each and every one. And yes life is gathering your inner resources, dusting yourself off and getting up again. These chickens make me smile. They are adorable, each with their own personality! Chickens always make me smile. I have 16 chickens and they're fun to watch. 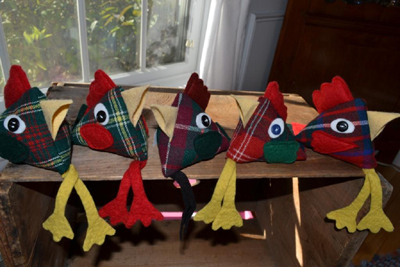 They all have different personalities like your pin cushion chickens. 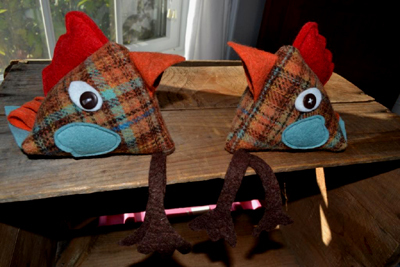 Luanne Hutchison....love the chickens, so creative! Your little chickens light up my day! I would love to have one roost in my kitchen. Count me in the drawing, please. What special talent you have and what a neat idea. It would be great to win one and add it to my collection of sewing and knitting accessories. Thank you. Very cute pincushions... they are adorable. I have never seen anything quite like them before. Hannah nr Buffalo? I do have you on my list, and got the others that entered as well!...now I am nervous about my site working right!! 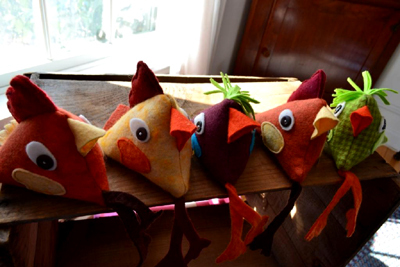 Your little chicken pin cushions are so cute. I would love to win one. I got my own "Chicken Little" about 3 weeks ago; a rescue from a farm where the bigger hens were picking on her. She's so tiny, the name came easily. Your creations are lovely! Would think of Chicken Little as a mascot more than a pincushion..am following the cabinet choices of this president elect, although I have consistently voted in the past, never followed the particulars like I am now. Am trying to keep an open mind. I would love to send a pincushion to my dear friend, Ellen, a quilter. Your pincushions are a work of art and I have just the friend who would appreciate one for a Christmas gift! Thanks for your generosity in giving one away. Hope it's me who wins it! If you like homemade Italian cookies, visit cookierose.blogspot.com which is my blog. I haven't posted in awhile but the recipes for the most common cookies are in the earlier blogs. Happy Thanksgiving to you and yours! Nice chickens love the design and your use of colors. Love your chickens!!! If you don't draw my name, I'll purchase one!!! Love your chickens. I am a sewer so it would surely be used. I lost my beloved pet, Maddie, (beautiful sheltie) a couple of days ago. Your chickens make me smile. I felt much as you describe about the whole election thing. This time my candidate did win. We wish him well and much success. I like your chickens. They make me smile. These chickens are so cute! 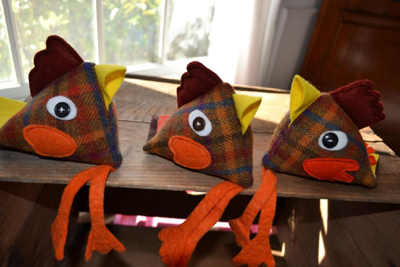 Your chicken pin cushions are adorable...love them!